Post office address is Burke unless shown in parenthesis. ADAMS CHARLES W., r 28, retired house painter and grainer, leases h of the estate of C. Gaskill. Adams Rhoda, r 28, widow of Stephen, who was a soldier of 1812. Adams Rodney, r 28, invalid. Ainger William G., (W. Burke) r 12, emp. Pass. R. R., h and lot. Aldrich Adelbert L., (W. Burke) r 12, dealer in jewelry and watches, h and lot. Aldrich Charles S., r 29 cor 31, farmer 100. ALDRICH ISAAC W., r 14, 8 grade Jersey cattle, farmer 150. Alexander Edward E , (W. Burke) r 12, teamster. Allard Hiram, (W. Burke) r 12, carpenter and millwright, h and lot and 40 acres. Allard Jason, (W. Burke) r 12, notary public, millwright and farmer 24. Ames J. Wesley, r 33, farmer 100. Amidon Carl C., (E. Burke) r 50, clerk for F. E. Dwinells. Amidon Christopher C., (E. Buke) r 45, farmer 66. Atkins John, (W. Burke) r 12, laborer. Austin David C., (E. Burke) farmer 61. AYER LOREN C , (E. Burke) r 49, carriage trimmer, owns h and 4 acres. Baker Simon, (W. Burke) r 13, retired miller. Barnes Emma Miss, (W. Burke) r 12, school teacher. BARNEY ALONZO, r 14, 13 sheep, 400 sugar trees, farmer 70, served in Co. H, 15th Vt. Vols. Batchelder J. Wesley, r 29, music teacher and farmer in Sheffield 140. BATCHELDER WILLIAM L., r 29, mail carrier and farmer 10. Beckweth Silas, (W. Burke) r 12, farmer 125. Belden William, r 45, farmer 200. Belden G. Woodruff, (E. Burke) r 50, retired farmer. Bell Amos, (E. Burke) r 60, farmer 5. BELL THERON, r 29, justice of the peace, town clerk and treasurer, owns h and 4 acres. Belval David, (E. Burke) son of Peter. Belval Peter, (E. Burke) r 58, farmer 220. BEMIS ISAAC D., (E. Burke) r 50, notary public, dealer in dry goods, boots, shoes, 5 and IO cent counters, h and lot. BEMIS JOHN S. J., r 14, farmer 30. BERRY WILLIAM N., (W. Burke) r 12, conductor Pass. R. R., h and lot and 2 acres. Bigelow Justin S., (W. Burke) r 12, laborer. BISHOP HARVEY L. G., r 28, sawyer. BLANCHARD SILAS R., r 27, farmer 30. BOLTON GEORGE W., M. D., (W. Rurke) r 12, allo. and homeo. physlclan and surgeon. Booth William, (W. Burke) r 26, farmer 96. BOWDITCH WILLIAM C., Jr., (E. Burke) r 50, house, carriage and ornamental painter. BOWMAN WALTER R., r 14, 30 grade Devon cattle, 52 sheep, 1,300 sugar trees, farmer 285, and in Newark 160. Bowman Willard E., r 14, farmer with his father, Walter R.
Boyce Allen R., (W. Burke) r 47, 20 sheep, 1,200 sugar trees, farmer 170. BOYCE JAMES W., (W. Burke) r 47, farmer with his father, Allen R.
Brockway Willard, (E. Burke) r 37, farmer 4. Brockway William, (E. Burke) r 37, with Willard, farmer. Brown William F., (E. Burke) r 38, farmer with H. Whitney. Buel Sarah A., r 28, nurse. Bugbee Harley N., (W. Burke) r 13, son of Selim N.
BUGBEE HIRAM, (W. Burke) r 9, 12 grade Jersey cattle, 20 sheep, 1,000 sugsr trees, farmer 147. Bugbee Selim N., (W. Rurkp) r 13, laborer. BUGBEE SERENO D., (W. Burke) r 9, 13 grade Devon and Jersey cattle, 20 grade Cotswold sheep, 1,000 sugar trees. mason and farmer 260. Bundy Asahel, (E. Burke) r 52. 15 grade Devon cattle, 20 sheep, 500 sugar trees, farmer 75. Bundy Willard P., (E. Burke) r 52, farmer with his father in Essex Co. 75. Burke Adolphus. (E. Burke) r ---, farmer 30. BURKE MOUNTAIN HOUSE, (E. Burke) r 50, C. C. Thurber, prop. BURNS ESDRAS D., (W. Burke) r 26, telegraph operator P. R. R., and farmer 14. Burpee Alfred K ,( W. Burke) r 25 cor. 48, with his mother, Sarah H , farmer 96. Burpee Heman P., (E. Burke) r 50, blacksmith with his father, Horace. BURPEE HORACE, (E. Burke) r 50, blacksmith, owns shop, h and 8 acres..
Burpee Sarah H., (W. Burke) r 24 cor. 48, widow of Plummer, with her son, farmer 96. BURPEE WILLIAM F., (W. Burke) r 25 cor. 48, prop. saw-mill on r 46. Burrington Sarah E., r 14, widow of Fernando C., resident, aged 68. Burt Uri, (W. Burke) off r 11, constable, collector, carpenter, and farmer 50. Buswell Charles H., (W. Burke) r 12, clergyman and insurance agent. Buzzell Silas, (E. Burke) r 50, laborer. Carpenter Lydia W., (W. Burke) r 12, widow Dr. W. W., resident, aged 61. Carr Arnold E., r 14, 15 grade Devon and Durham cattle, 10 sheep, 600 sugar trees, farmer 120, served in Co. L, 1st New England Cavalry. Carr Edmund L., (W. Burke) r 12, photographer, owns 10 acres in Sutton, served in Co. K, I 1 th Vt. Vols. Chappell Charles H., (W. Burke) teamster. Chase Charles, (E. Burke) h and lot. Cheney James Horace, (W. Burke) r 1, farmer 50, and in Newark 220. Clark Maria L. Miss, (E. Burke) r 37. resident. Clark Marshall A., (W. Burke) emp. Passumpsic R. R.
Cleveland Calvm, (W. Burke) r 12, student. CLEVELAND FRANCIS B., (W. Burke) r 12, lumberman and mill foreman. Cleveland Francis B., Jr., (W. Burke) r 12, student. Cleveland Peter, (W. Burke) r 12, stationary engineer. Cobleigh Eliza, r 18, widow of Hosea, farmer 225. Cobleigh Harlan W., (W. Burke) r 12, fireman on Passumpsic R. R.
COBLEIGH JUSTIN, (W. Burke) r 12, farmer in Sutton 38, h and lot. Coe Arthur E., r 21, farmer with his father, Mortimer D.
COE DANA, r 21, 16 head cattle, 25 Shropshiredown sheep, 1,500 sugar trees, farmer 480. Coe David, r 14 cor. 15, (Coe & Glines) dealer in general merchandise, postmaster, owns 3 stores and 340 acres. COE ELLIS M., r 15, prop of shingle-mill, owns 4 acres, 40 acres timber land, and in Newark 90. COE HARLOW, (E. Burke) r 56, 22 head cattle; 2 Morgan brood mares, Chester White hogs, 500 sugar trees. farmer 240. Coe Herbert 0., r 21, farmer with his father, Mortimer D.
Coe Horace B., r 39, farmer 185. Coe Mortimer D.. r 21, 25 head grade Herefords, Devon and Durham cattle, 23 sheep, 500 sugar trees, farmer 300. Coe Oliver, r 21, retired farmer. Coe William W., (W. Burke) r 12, (Coe & Underwood) deputy sheriff. Coe & Glines, r 14 cor. 15, (Albert N. G. and David C.) general merchandise. Coe & Underwood, (W. Burke) r 12, (William W. C. and Alexander P. U.) dealers in general merchandise. COLBY MARCELLUS L., (W. Burke) r 12, butcher, owns h and lot, served in Co. D, 4th Vt. Vols. COLBY NEWELL S., (W. Burke) r 11, (Warren & Colby) blacksmith, owns h and lot, and in Sutton 30 acres. Coochier Francis, r 29, farm laborer. COUNTER GEORGE H., (E. Burke) r 50, stationary engineer, h and lot at Burke Hollow. Counter Joseph, (E. Burke) r 32, live stock breeder and dealer, 12 head cattle, farmer 34, and leases of James Counter 144. (Died 1886). Counter Richard O., (E. Burke) r 53, farmer 80. Counter Walter, (E. Burke) live stock dealer. Cowles Jefferson, (W. Burke) r 12, farmer 70. Craft George W., (W. Burke) r 12, carriagemaker. Craft Sarah L. Mrs., (W. Burke) r 12. dressmaker. CUMMINGS HIRAM R., r 13, emp. Pass. R. R., farmer 8, served in Co. I, 15th Vt. Vols. Cummings Irene E. W. Mrs., r 13, dressmaker. Currier Eli A., (E. Burke) r 50, harnessmaker, owns h and lot. Cushing Daniel B., (E. Burke) dealer in groceries, flour, and country produce. Cushing Daranzel W., r 21, Percheron stock horse, 1,100 sugar trees, and farmer 144. Cushing David P., r 21, farmer with his father. CUSHING HAYNES P., (E. Burke) r 38, pastor M. E. church at W. Burke, h and 3 acres. Dagle Joseph, (E. Burke) r 57, owns 50 acres. Darling Henry G., (E. Burke) r 45, retired farmer. DARLING LUCIUS A., (E. Burke) r 45, 42 thoroughbred Jersey and Devon cattle, 51 head registered, 32 grade Cotswool sheep, 2 Morgan brood mares, Chester white swine, 700 sugar trees, supt. of stock farm owned by Elmer A. Darling, of New York city. Dashney Ann, (E. Burke) off r 61, widow of Lewis. Dashney John S., (E. Burke) off r 61, farmer 90. DAVIS CHARLES B., M. D., (W. Burke) r 11, homeo. physician and surgeon, h and lot. DAVIS ELEAZER, r 28. wagon repairer, 225 sugar trees, and farmer 40. Davis Ethan A, (W. Burke) r 11, laborer. Davis Flora N., (W. Burke) r 11, dressmaker. Davis Frank M., r 28, farmer, with his father, Eleazer. Davis Fred C. H., (W. Burke) r 11, barber and horse trainer. Davis George H., (W. Burke) commercial traveler. Davis Leroy C., r 28, farm laborer. Dean Etta L. Miss, (W. Burke) r 13, school teacher. Dean George A., (W. Burke) r 11, prop. grist-mill. Dean George M., (W. Burke) r 13, miller, owns 2 acres. Dean Noah, (W. Burke) r 11, resident. Denneville Joseph, (W. Burke) laborer. Densmore Charles S., (W. Burke) section hand, h and lot. Densmore Daniel R., (W. Burke) r 12, postmaster, and dealer in groceries, clothing and gent's furnishings. Dodge Edwin M., r 40, farmer, leases of E. D. Griffin 70. DODGE HERBERT L.. (W. Burke) r 48, peddler, 6 head cattle, 8 sheep, 500 sugar trees, and farmer 119. Doloff Lorinda, (W. Burke) r 11, widow of Russell. Doyle Lizzie M. Miss, (W. Burke) r 25, dressmaker. Doyle Gilbert E., (W. Burke) r 25, farm laborer. Doyle Herbert L., (W. Burke) r 29, prop. livery stable. Doyle Selim N., (W. Burke) r 15, carpenter and joiner, 12 cows, 30 sheep, 1,000 sugar trees, and farmer 156. Doyle Zenas T., (W. Burke) r 12, canvassing agent. Drew Mary, (E. Burke) r 50, widow of Samuel, resident, aged 81 years, pensioner war 1812. Dwinell Fred E., (E. Burke) r 50, allo. physician and surgeon, dealer in drugs, medicines, boots and shoes, h and lot. DROWN CHARLES W., (E. Burke) r 53, farmer 25. Drown Welcorne, (E. Burke) r 53, farmer 25. DUNKLEE GEORGE J., (W. Burke) r 48, veterinary surgeon, stock horse "Glover Boy," and farmer 15. Dunklee Harley K , (W. Burke) r 48. school teacher, student of medicine. Dunsire Jonathan G , (W. Burke) r 26, farmer 20. Dunsire Mary J., r 15, widow Josiah H., hair dresser and dealer in human hair, owns h and lot. Dunsire William, r 17, farmer 100. DUVAL FRANK, r 29, farmer. Duval Henry, r 15, laborer owns h and lot. Duval Henry, Jr., r 15, laborer. Duval Wilber, r 15, laborer. Eggleston Artemas, (E. Burke) r 61, farmer 7. EGGLESTON EZRA S., (E. Burke) r 61, carpenter and joiner and bridge builder, 10 head of cattle, farmer 140. Eggleston Harriet A., (E. Burke) r 61, widow of John M., resident, aged 71. Eggleston James M., (E. Burke) r 61, carpenter, farmer 27. Eggleston Royal A, (E. Burke) off road 61, carpenter and millwright, 11 head grade Devon cattle, 800 sugar trees, farmer 275, served in Co. E, 9th Vt. Vols. Elliott James, (W. Burke) r 41, laborer. Emory Ira, (W. Burke) r 12, harnessmaker, 700 sugar trees, farmer 100. Fairbanks George W., (W. Burke) r 14, 22 head of cattle, 20 sheep, 600 sugar trees, farmer 180. Fairbanks William E., (E. Burke) r 52, farmer, leases of W. A. Goding 9 acres, served in 1st Artillery 11 th Vt. Vols., 2d brigade 2d division 6th army corps. Fairbrother Arthur C., (W. Burke) r 42, farmer 94. Fairbrother James, (W. Burke) r 24. farmer 100. FAIRBROTHER THOMAS, (E. Burke) r 50, retired farmer 23. FARMER ALONZO C., (E. Burke) r 63, live stock breeder and dealer, 30 head of thoroughbred Jersey cattle, breeder of Brown Leghorn, Plymouth Rocks, Bronze turkeys, Morgan horses, Poland China hogs, 1,400 sugar trees, farmer 200, served as sergeant in Co. E, 15th Vt. Vols. Farmer Bradley, (E. Burke) r 63, retired carpenter. Farmer Jacob S., r 14, carpenter and joiner, owns h and 4 acres. FARNHAM GEORGE E., r 28, 10 head of grade Jersey and Durham cattle, 600 sugar trees, and farmer 120. Farnham Rhoda Bell Miss, r 28, school teacher. Favrow Napoleon, (W. Burke) r 11, laborer. Fletcher Hiram, (W. Burke) r 11, farmer, owns h and lot and 66 acres. Flint Frank E., (W Burke) r 12, clerk for D. Densmore. Finney Alfred L., (E. Burke) r 38, 15 head grade Devon cattle, 25 sheep, 800 sugar trees, farmer 200. Finney William H., (E. Burke) r 36, farmer 45. FOGG WARNER C., (W. Burke) invalid, veteran, served in Co. I, 15th Vt. Vols. Forrest Lunette I., Miss, r 13, school teacher. Forrest John E., (W. Burke) r 12, manuf of sash, blinds and doors, owns shop, h and lot, served in Co. F, 1st N H. Artillery. Forsaith Austin K.. (W. Burke) r 12, telegraph operator. Foss William T.. (W. Burke) r 11. laborer, served in Co. B, 3d Maine Regt. FOSTER CHARLES W., (E. Burke) r 38, sawyer, farmer 75. Frasier Amasa L., (W. Burke) resident, retired broker, bds. Main. FRASIER CURTIS, (E. Burke) r 52, live stock breeder and dealer, 30 head grade Jersey and Devon cattle, farmer 214. Frasier Fred H., (W. Burke) r 12, emp. of Quebec Lumber Co.
Frasier Luther T., (E. Burke) r 61, farmer 70. Freeto Ziba, (E. Burke) r 50, sawyer, h and 3 acres. Fullerton John W., r 28, manuf. of liniment kidney cure and cough medicines, and peddler, leases h of W. Fletcher. Fyler John A., r 15, selectman, carpenter and Jomer, 16 head Devon and Durham cattle, 25 sheep, 1,000 sugar trees, and farmer 250. Gage Horace W., (W. Burke) r 50, farmer, h and lot. Gage Isaac, (E. Burke) r 52, 25 sheep, 1.500 sugar trees, farmer 200. GAGE POLLY, (E. Burke) r 52, widow of Moses, resident, aged 90 years. Garfield Edwin C., off r 14, farmer 70. Gaskill Benjamin F., (W. Burke) r 25, 17 head cattle, 20 sheep, 600 sugar trees, farmer with Henry. Gaskill Eldorado L., (W. Burke) mill hand, h and lot. GASKILL ELIAS B., (W. Burke) r 25, 15 head cattle, 25 sheep, 1,200 sugar trees, farmer 112. Gaskill Henry, (W. Burke) r 25, farmer with B. F. 160. Gaskill James E., (W. Burke) r 25, farmer with his father. Gaskill Silas, r 28, farmer 62, served in Co. K, 15th Vt. Vols. Gilfillan Carlos, (W. Burke) r 12, laborer. Gilfillan Gilbert J., (E. Burke) r 33, 15 head cattle, farmer 120. Gllfillan James, (E. Burke) r 33, retired farmer. Gilfillan Robert, (E. Burke) r 33, 12 head grade Devon cattle, farmer 131. Gilman David, W. Burke) r 26, manuf. sap tubs. GILMAN GEORGE, (W. Burke) r 26, 6 head cattle, 800 sugar trees, farmer 100. Gilson David, (E. Burke) r 50, retired farmer, h and lot, and farm 135. Gilson Laura M., r 14, widow of Loren A., aged 67. Glidden Almos B., (W. Burke) r 11, furniture repairer, undertaker, owns h and lot. Glines Albert N., r 14 cor. 15, (Coe & Glines) general merchant, served in Co. G, 17th Vt. Vols. Godding Addie B., (E. Burke) r 51, school teacher. GODDING WILBER B., (E. Burke) r 51, 14 sheep, one Morgan mare, farmer 70, and with D. Gilson pasture 60. GODDING WILLIAM A., (E. Burke) r 52, supt. of Hall & Chase's sawmill, owns h and lot, and 9 acres. Gonyea Clevois, (E. Burke) r 53, farmer 170. Goss George E., (E. Burke) 300 sugar trees, farmer 91. Goss Leverett D., (E. Burke) r 53, 350 sugar trees, farmer 94. Grassett Theophile, (E. Burke) r 50, laborer. Gray Don H., (E. Burke) painter, owns store, h and 2 acres. Gray Sarah S., r 28, widow of Mark, h and lot. Green John, (W. Burke) r 11, teamster. Green Loren W., (W. Burke) r 11, laborer, h and lot. Gregory George, (E. Burke) r 50, retired farmer, h and 6 acres. GRIFFEN EDWARD D., r 40, farmer 70. Hackett Alonzo W., r 16, farmer 50. Hackett Chester A., r 16, farmer with A. W.
HARRIS CHARLES .4., (E. Burke) r 50, postmaster, dealer in general merchandise, owns store, h and lot and farm 400. Harris Maly E, (E. Burke) 1 50, school teacher. Hartwell Sumner, (W. Burke) r 11, laborer, h and lot. Harvey Eddie R., (E. Burke) r 60 cor. 61, farmer with his father, Napoleon. Harvey Elbert H., (E. Burke) r 60 cm. 61, farmer with Napoleon. HARVEY FRANK C., (E. Burke) off r 57, with his father, Rinaldo, farmer 80. Harvey Fred E., (E. Burke) r 60 cor. 61, farmer with his father, Napoleon. HARVEY GEORGE, (E. Burke) r 55, manuf. of butter tubs, owns factory, and farmer 50. HARVEY NAPOLEON, (E. Burke) r 60 cor. 61, 12 head cattle, 20 sheep, farmer 120. HARVEY RINALDO, (E. Burke) off r 57, 10 cows, farmer 80. Harvey Willie A., (E. Burke) r 60 cor. 61, farmer with his father, Napoleon. HASTINGS WILLARD, (Sutton) r 47, 400 sugar trees, farmer 23. Hawthorn William, (W. Burke) r 11, section foreman on Passumpsic R. R.
Hayward George W., (W. Burke) off r 12, W. U. tel. operator at White River Junction. Hayward Levi F , (W. Burke) off r 12, carpenter anrl joiner, h and Iot. Hayward Maggie M., r 28, dressmaker, and school teacher. Higgins Allen, (E. Burke) laborer. Higgins Charles W., (E. Burke) r 50, teamster. Howard Abbie, (E. Burke) r 50, widow of Alonzo. Howard Abner, (W. Burke) retired M. E. clergyman. HOWLAND ABBIE R., (E. Burke) r 50, widow of Alonzo S., owns h and lot and farm 60. Howland Charles B.. r 22, farmer with C. W.
Howland Charles W., r 22, 30 grade Devon cattle, 20 sheep, 900 sugar trees, farmer 303. Howland Charles W., (E. Burke) r 52, farm laborer. Hubbard Ela O., (E. Burke) r 34, farmer. Hubbard John B., (E. Burke) r 62, farmer 150. HUMPHREY ALDIS B., (E. Burke) r 38, (Humphrey & Gray) 20 grade Durham and Devon cattle, Chester white hogs, farmer 207. Humphrey Alvah J., (E. Burke) r 61, farmer, leases of C. Humphrey 160. HUMPHREY CHARLES T. A., (E. Burke) off r 51, retired merchant, overseer of the poor, town agent, three houses and lots, farm 351, and in Sutton 100. Humphrey Edward M., (W. Burke) r 24, farmer with Ira. Humphrey Erastus, (E. Burke) r 42, oldest man in town, aged 90, April, 1886, owns farms 240. Humphrey Ira, (W. Burke) r 24, farmer 100. Humphrey Julius A, (E. Burke) r 42, farmer 60. Hurnphrey Marilla C., (E. Burke) r 50, widow of Joseph B. F., farmer 150. Humphrey & Gray, (E. Burke) r 50, (A. B. H. and C. H. G.) props. gristmill, own h and lot. Hunter Ida A. Miss, (E. Burke) r 53, school teacher. Hunter Jesse A., (E. Burke) r 50, blacksmith, owns shop. HUNTER STEPHEN W., (E. Burke) r 53, 20 sheep, 800 sugar trees, mason and farmer 131. Huntington Nancy, (E. Burke) r 38, widow of William M., aged 84. Jacobs Aurilla, (W. Burke) r 12, dressmaker. Jenkins Benjamin F., (E. Burke) r 45, farmer 120, served in Co. E, 15th Vt. Vols. Jenkins Eugene A., (E. Burke) r 51, laborer, h and lot. JENKINS JOEL, (E. Burke) r 62, 6 head cattle, 400 sugar trees, farmer 200. Jenkins Jonathan B., (E. Burke) r 62, farmer 85. JENKINS LEWIS, (E. Burke) off r 45, 20 sheep, 700 sugar trees, farmer 86 1/2. Jenkins Orrin, (E. Burke) r 62 cor. 63, teamster and farmer. Jennes Hiram D., (W. Burke) emp Quebec Lumber Co., h n depot. Keach John, (E. Burke) off r 61, farmer. Kenison Azro H., r 28, harness and shoemaker, served in Co. D, 1st Vt. Cavalry, owns h and lot and 142 acres. Kenison May S., r 28, school teacher. Kimball Clark C., (W. Burke) r 12, carpenter and joiner. Kimball James S., (W. Burke) r 11 car 7, station agent Passumpsic R. R. and farmer 30. KING DAVID W., r.29, teamster, served in Co. E, 15th Vt. and in Co. D, 9th Vt. Vols. KING SARAH A., r 30, widow of David, farmer 35. King Theodore E., r 30, farmer with his mother, Sarah A.
KINISON DANIEL W., (W. Burke) r 12, wagon repair shop, served in Co. A, 11th Vt. Vols., owns h and shop. Labbor Joseph, (E. Burke) r 55, blacksmith and farmer 60. Ladd Asa H., (W. Burke) r 25, retired farmer. Ladd John, (W. Burke) r 3, laborer. Ladd Willie E., (W. Burke) r 25. laborer. Lane Henry J., (E. Burke) r 5, allo. physician. Lavalley John, (E. Burke) r 54, laborer. Leach Silas E., (W. Burke) farmer. Leonard Orlando L., (W. Burke) r 29, harnessmaker, leases shop of N. Dean. Libbey H. Warren, r 15, owns saw-mill, farmer 125. Lord Henry C., (E. Burke) retired. LOWELL AMOS H., (E. Burke) r 50, shoemaker, 1 reg. Jersey cow, h and lot. Lowell Matilda Miss, (E. Burke) r 50, school teacher. Lute Clarinda E., r 15, widow of Gamaliel, owns farm 20. Lund 0. L., (E. Burke) off r 35, farm 96. Lunge James, r 32, 15 head cattle, 15 sheep, 600 sugar trees, served in Co. E, 9th Vt., and Co. I, 15th Vt. Vols., farmer 132. Marshall Benoni H., (W. Burke) r 14, grade Durham and Devon cattle, 16 grade Cotswold sheep, 500 sugar trees, farmer 260. Marshall George D., (W. Burke) r 11, carpenter. Marshall Jesse, (W. Burke) r 10, lister, 20 head cattle, 35 sheep, farmer 200. Marshall Timothy L., (W. Burke) r 11, wood worker, owns h and lot. Marshall Willie W., (W. Burke) off r 3, farmer. Martin Charles E., (W. Burke) r 11, shingle sawyer. Martin George, (E. Burke) off r 20, farmer 125. Martin Lucius B., r 29, farm laborer. Marvin Delos R., (W. Burke) r 11, teamster, h and lot. Masten Margaret, (W. Burke) r 12, widow of Justin. McDonald George C., (E. Burke) r 50, student. McDonald John, (E. Burke) r 50, pastor M. E. church. McDonald John, r 29 cor. 30, farmer 44. McNEAL JACOB, (W. Burke) r 13, retired farmer. Mineburg David, (W. Burke) r 11, butcher. MORRILL LUTHER, (E. Burke) r 38, 9 grade Jersey and Durham cattle, 250 sugar trees, farmer 79. Moulton Alba J., (W. Burke) r 1, farmer 160. Moulton Alva, (W. Burke) r 4, farmer with his father, Ira. Moulton Elizabeth, (W. Burke) r 25, widow Reuben, resident, aged 76. Moulton Ira, (W. Burke) r 4, farmer 150. Moulton Henry M., (W. Burke) (Morton & Ruggles) wheelwright, shop at mill, h r 12. Moulton & Ruggles, (W. Burke) (H. M. Moulton and J. F. Ruggles) props. of custom saw-mill. Newell Charles C., (E. Burke) r 50, retired merchant, farm 104. Newell Fred A., (E. Burke) r 61, farmer 168. Newell James E., (E Burke) r 62, house and carriage painter. Newell Mary P., (W. Burke) r 12, widow of Nathan P., aged 54. NICHOLS ROBERT, (W. Burke) r 41, 5 head of cattle, 300 sugar trees, farmer 77. Norris Eleazer W., r 28, blacksmith and farmer 130. OLCOTT LYDIA M., r 28, widow of Nathaniel, resident, aged 58 years. Orcutt Lorenzo W., (W. Burke) r 13, farmer 100. OTIS JOSEPH P., (W. Burke) r 13. lawyer, owns h and lot and 33 acres. Otis Stephen C.. (W. Burke) r 12, corn. trav. for Soluable Pacific Guano Co., owns h and lot. Packer Halsey H., (W. Burke) r 12, boot and shoemaker, served in Co. C, 3d Vt. Vols., owns h and lot. Page Emma L., (E. Burke) r 50, school teacher. Page Enoch S., (E Burke) r 37, 10 grade Devonshire cattle, 15 sheep, farmer 133, served in Co. A, 11th Vt. Heavy Artillery. Page Garo H., (E. Burke) r 50, repair shop, wagon maker and dealer in coffins, owns shop, h and lot. 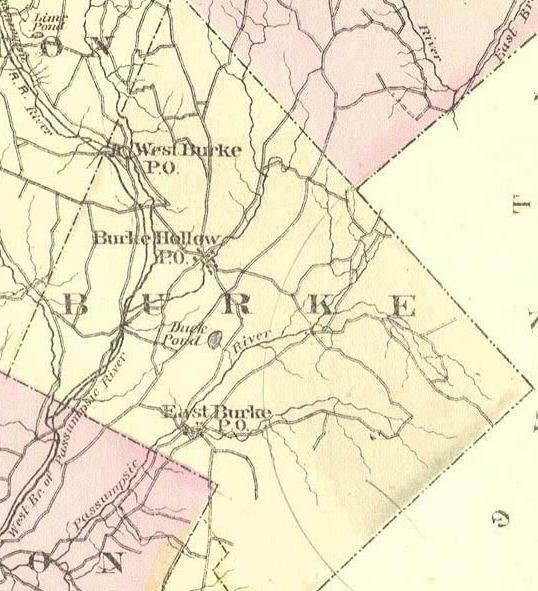 Parker Ezra E., (W. Burke) r 12, mill hand, h and lot. Parker Roancy L., (E. Burke) r 50, school teacher. PHILLIPS CHARLES, (E. Burke) r 50, sawyer, served 3 years in Co. E, 15th Regt.. and Co. E. 9th Vt. Vols. Phillips Edward E., (E. Burke) r 50, sawyer and house painter, served in Co. B, 34th Mass. Regt. Phippen Elmore H., (E. Burke) r 63, 15 grade Jersey cattle, 500 sugar tlees, farmer 82. Phippen Lucius A., (E. Burke) r 50, dealer in caskets, wagon repair shop, owns shop, h and 3 acres. Porter Abigail, (W. Burke) r 12, widow of Robert P., aged 77 years. PORTER PERRY, (W. Burke) r 12, dealer in groceries, clothing, boots and shoes, phosphate, Iumber and shingles, owns h and lot and 100 acres, served in Co. K., 8th Vt. Vols. Powers Ezra. (W. Burke) r 11, 5 head cattle, farmer 90. Powers Frank W.. r 34, farmer with his father, Noah S.
Powers Harley M., (W. Burke) r 12, bridge builder on Pass. R. R.
Powers Noah S., r 34, farmer 140, served in Co. A, 3d Vt. Regt. Prouty Emily, (E. Burke) r 50, widow of Samuel, aged 76. Prouty Harvey, (E. Burke) hay presser. Quebec Lumber Co., (W. Burke) lumber dressing mill n R. R. station, F. B. Cleveland, supt. Richardson Francis, (W. Burke) prop. of Trull's Hotel. Roberts Arthur, (E. Burke) r 58, farmer 155. ROSS JOHN A., (W. Burke) r 48, farmer 48. Roundy Leroy G., (W. Burke) r 11, mill hand. Ruggles John F., (W. Burke) r 12, (Moulton & Ruggles) machinist, watchmaker, jeweler and druggist. Russell Maria, (W. Burke) r 47, widow of Luther, farm 30, aged 76 years. Ryther Harley J., (W. Burke) mill hand, h and lot. Salomon Julia, (W. Burke) r 11, milliner. Salomon Robert, (W. Burke) r 11, dialer in general merchandise, boots and shoes, clothing, millinery, flour and feed, owns store, h and lot. SAXBY PARMENAS W., r 29, 6 grade Jersey and Durham cattle, farmer 30. SHANNON JAMES A., (W. Burke) r 12, emp. in Trull's Hotel. SHURTLEFF LYSANDER G., (E. Burke) stave sawyer at B. F. Lincoln's saw-mill. Silsby Almont H., (W. Burke) teamster. SILSBY HARVEY, (W. Burke) r 11, dealer in farm produce, served in Co. B, 11th Vt. Vols., owns h and lot. Sllsby Wendell, (W. Burke) justlce ot the peace, lumber dealer and manuf., 15 acres and mill. Simons Clark Rev., (W. Burke) r 11, clergyman, h and lot. Sleeper Abigail, (W. Burke) r 12, widow of Lewis, resident, aged 73. Sleeper Mortimer L., (W. Burke) r 12, allo. physician and surgeon. Smith Charles W., (E. Burke) off r 38, retired farmer. Smith Clark M., (,W. Burke) prop. of Smith's Hotel, served in Co. H, 12th Vt. Vols., and Co. C, 7th Vt. Vols. Smith Dana O., (E Burke) r 20, farmer with Oglander. Smith David, r 20, farmer. Smith David C., (W, Burke) r 8 n 7, carpenter, h and lot. SMITH ERWIN W., (E. Burke) off r 38, school supt. and teacher, 10 head grade Durham, Jersey and Devon cattle, 10 sheep, and farmer 150. Smith Frank P., off r 18, with 0. P. Humphrey, farm 50. SMITH HARRIS, (E. Burke) r 50, retired merchant, owns store, h and 9 acres. SMITH HIBBARD, (E. Burke) r 50, carpenter. SMITH HORACE S., r 21, carpenter and joiner, 16 grade Durham cattle, 25 sheep, 800 sugar trees, and farmer 167. SMITH JOHN, (E. Burke) r 53, 10 grade Devon cattle, farmer 160. Smith Joseph H., r 15, fartner 70. Smith Josiah D., r 28, 10 cattle, farmer 72. Smith Juba, (W. Burke) r 11, laborer. SMITH OGLANDER, (E. Burke) r 20, 700 sugar trees, and farmer 73, served in Co. F, 9th Vt. Vols. SMITH OLNEY, r 28, retired farmer, owns h and lot. Smith Philip, r 14, farmer 25. Smith's Hotel, (W. Burke) C. M. Smith, prop. Snell George W. B., (E. Burke) r 50, student and school teacher. Spencer Charles A., (W. Burke) r 48, 500 sugar trees, farmer 110, served in Co. G, 21st U. S. Infantry. STAFFORD JAMES P., (E. Burke) blacksmith and horse-shoer, owns h and lot, served in Co. K, 56th Mass., and Co. D, 16th N. Y. Vols. Stockwell Levi W., r 29, farmer 20. Stoddard Amelia A., (E. Burke) r 50, widow of Phineas, aged 76 years, owns h and lot. Stoddard Frank B., (E. Burke) r 33, farm laborer. Stoddard Marshall W., (W. Burke) r 11, justice of the peace, retired lumberman, and farmer 480. Strerter Burton W., (E. Burke) r 36, farmer with his father, John H.
Streeter John H., (E. Burke) r 36, farmer 69. STREETER WILLIAM R., (E. Burke) r 50, constable and collector, blacksmith, h and lot, farmer 48. SULLOWAY JACOB J., (W. Burke) r 11, harnessmaker, owns h and lot and shop. Tabor Emily Mrs., (E. Burke) r 50, dressmaker. Temple Frank E., (E. Burke) r 20, farmer. Thayer Austin W., (W. Burke) r 24 cor. 25, farmer 150. Thayer Robert S., (W. Burke) r 24 cor. 25, farmer with his father, Austin W.
Thibodeau Peter, (E. Burke) laborer. Thibodeau Joseph, (E. Burke) r 50, laborer. Thompson Charles W., (W. Burke) r 7, 12 head cattle, 700 sugar trees, farmer 175. Thompson Frank W., (W. Burke) trainman P. R. R.
Thompson Gratia, (W. Burke) r 11, widow of William, aged 90. Thompson Nancy C., (W. Burke) r 12, widow of Charles. Thompson William W., (W. Burke) r 11, laborer, h and lot. THURBER CHARLES C., (E. Burke) r 50, prop. of Burke Mountain House. Thurber John, (E. Burke) r 53, 400 sugar trees, farmer 100. Thurber True, (E. Burke) r 53, farmer. TOWNSEND DANIEL S., (W. Burke) r 13, retired merchant, owns 5 acres in Sutton. Townsend Martha A, (W. Burke) r 13, school teacher. Tyler Hattie E., r 15, school teacher. Varney Mary A., (W. Burke) r 11, widow of James K., resident, aged 44 years. WALTER BETSEY A., (E. Burke) r 33, widow of Augustus P., 30 head cattle, 50 sheep, 1,300 sugar trees, farmer 330. Walter Calvin R , (E. Burke) r 34, 10 head cattle, farmer 100. Walter Charlotte C., (E. Burke) r 33, widow of Porter, aged 76 years. Walter Hilaman, (W. Burke) r 12; carpenter and farmer, in Sutton 30 acres, owns h and lot. Walter Herbert E., (E. Burke) r 33, dealer in jewelry at Newport, Vt.
Walter Lemuel, r 27, farmer 157. WARREN LORENZO, (W. Burke) r 11, (Warren & Colby) blacksmith, selectman, owns h and lot, shop and 26 acres. Warren & Colby, (W. Burke) (Lorenzo W. and Newell S. C.) blacksmiths. Washburn Nathan J., (W. Burke) r 12: emp. Pass. R. R., owns h and lot. Watchie John B., (W. Burke) r 11, blacksmith, and manuf. of wagons and buggies, h and lot. Watchie Lewis S., (W. Burke) r 11, blacksmith for John B. Watchie. Watson Charles, (W. Burke) r 11, retired farmer. Watson Larnard, (W. Burke) resident with I. Humphrey. Way Emerson A., (W. Burke) r 12, (Way & Son) hardware dealer. Way Erastus, (W. Burke) r 12, (Way & Son) hardware dealer. Way & Bartlett, (W. Burke) (F. A. W. and Simon Bartlett, of Sutton) produce and provision dealers. Way, Willey & Co., (W. Burke) (W. C. Way and F. J. Willey) stove and tinware dealers. Way & Son, (Erastus W. and Emerson A. W.) dealersin crockery, stoves and hardware, manufs. of tinware, own h and lot, and in Sutton 100 acres. Welch Charles L., (W. Burke) laborer. Wells Francis, (E. Burke) r 51, farmer 60. Wetherbee Alden, (W. Burke) r 25, 500 sugar trees, farmer 152. Wheeler Herbert C., (W. Burke) r 3, carpenter. Wheeler Warren S., (W. Burke) r 3, carpenter, and farmer 60. Whipple George B., (W. Burke) r 47, manuf. of butter tubs, and farmer 100. Whitcher Chester, (W. Burke) off r 3, retired farmer. Whitcher Newell W., (W. Burke) r 12, emp. Pease & Son's saw-mill, owns h and one acre. Whitcher Sam S., (W. Burke) off r 3, 13 head cattle, 400 sugar trees, farmer 207. WHITE MELVIN, (E. Burke) r 36, 10 grade Devon cattle, farmer with his father, Osman, 175. WHITE OSMAN, (E. Burke) r 36, retired farmer 175. WHITNEY HENRY, (E. Burke) r 38, 700 sugar trees, farmer 75. Wiggins Allen J., r 18, farmer, leases of Mrs. Eliza Cobleigh 225. Wiggins Andrew J., (W. Burke) r 48, farmer. Williams Adelbert O., (W. Burke) teamster. Willson Alvin W., (E. Burke) r 50, clerk for C. A. Harris, librarian for East Burke, h and lot. Wilmerson Lewis D., (W. Burke) r 25, laborer. Wilson Calvin J., r 28, 10 head cattle, farmer 70. Winchester Romanzo F , (W. Burke) r 12, sawyer, owns h and lot. Wishart Albert H., (W. Burke) r 25. farmer, with his mother. WISHART ALICE E MISS, (W. Burke) r 25, resident with Mercy M.
Wishart Mercy M. Mrs., (W. Burke) r 25, 30 fine wool sheep, 650 sugar trees and farmer 110. Woodruff George W., (W. Burke) r 5 cor 6, live stock breeder and dealer, and farmer 1,200.